This weekend I found a new park to run at, and I just love this place! For one, there are hardly any bikers on the trail because they do not allow fast speed biking on it. Secondly, it is a beautiful run full of nature, trees (lots of shade! 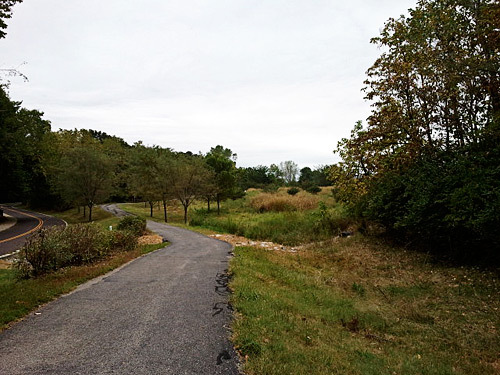 ), and a perfect mix of hills and level land. Added bonus, it is only 5.8 miles from my house! Here is a quick shot I took on Sunday after a 5 mile run. Also, someone showed me ‘My Tracks’, which is really neat because you can record your tracks and see it on a map. 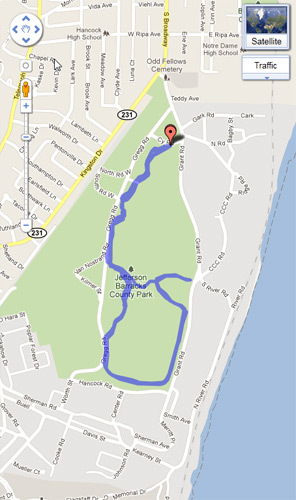 As you can see, I didn’t do the perfect figure 8 on this map for my 5 mile run, because I have no sense of direction. ;o)- Its a neat little app, though, and can be helpful if you need to find your way back.